Garlock HIGH-TEMP 9900 Graphite fiber/graphite flake, high-temperature fillers and a nitrile binder. A high temperature gasket sheet of graphite fibers/flake and a nitrile binder that is the most versatile of the high-temperature, high pressure CNA gasket sheets on the market. These hi-temp gasket materials have been laboratory tested for fire safety. They maintain effective seal during pressure and temperature fluctuations. 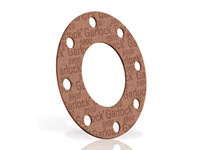 Garlock high temp gasket materials' superior torque retention lowers leakage rates and reduces maintenance time. +Contact Garlock Engineering with specific transfer fluid application. *Minimum recommended assembly stress = 4,800psi. Preferred assembly stress = 6,000-10,000psi. Gasket thickness of 1/16" strongly preferred. Retorque the bolts/studs prior to pressurizing the assembly. For saturated steam above 150psig, consult Garlock Engineering.